Property not prepared to an acceptable standard. Owner out of the country no local help or contact available. We left early. Owner has proposed £200 discount which I look forward to receiving shortly. We had a great holiday in this charming property in the centre of the beautiful village of Venterol. For us the situation and accommodation were perfect, as was the weather for the whole 10 days! Must also add how obliging and flexible the owners were- very anxious to ensure everything was good for our stay. Highly recommended. 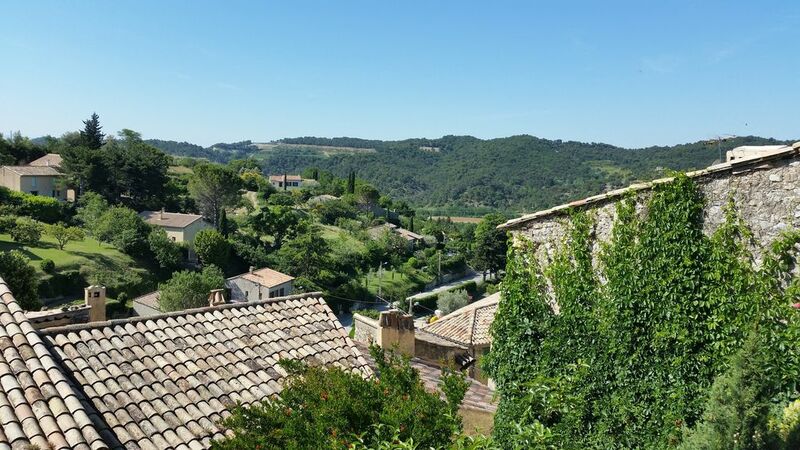 Venterol is a tucked away gem in the Rhône-Alpes region, a medieval "perched village," and this house is lovely, comfortable, and right off the center of the square. We loved the country hillsides of the area, where wine, olives, cherries, figs, apricots, and lavender grow in abundance. The people in the village couldn't have been nicer, and we felt particularly welcomed by the young proprietors of Café de la Poste. Our stay was heavenly: we woke up every morning to birdsong and the sound of church bells from the wrought-iron bell tower, and we spent our days roaming the countryside (this is a great spot for accessing nearby Roman ruins, vineyards, markets) or sitting on the terrace with tea and fresh bread. We even had the added curiosity of watching a film crew that was shooting in the town square. The house was well-appointed with all the amenities necessary for a very relaxing stay, and Ian was an excellent host. The only downside is that we booked this stay for far too short of a spell! Réservé au dernier moment, Ian a été très arrangeant pour nous dépanner et trouver le moyen de nous fournir les clés. Toujours très disponible et serviable. La maison est super, très lumineuse à partir du deuxième étage (celui de la terrasse) et le village est très typique et magnifique. Très agréable séjour en famille dans cette petite maison de village idéale comme point de départ de ballades. Terrasses très agréable au moindre rayon de soleil. Je tiens à préciser que Madame Goldsmith s'est montrée d'une disponibilité, d'une écoute et d'une gentillesse sans faille avant et pendant notre séjour. Un grand merci à elle. A surcharge of £25.00 per week applies to bookings over the Christmas and New Year periods (21/12 to 3/01) A 50 pounds sterling deposit required for breakages.A 25 pound optional prepayment for wood during winter months.Cancellation charges : 50% up to 6 weeks prior to rental period. 75% up to one week prior to rental. 100% if less than one week to start of rental.